The invention of the otter as the cup’s handle is thoughtfully and successfully executed. As with all great Woodlands carving ‘less is more’ and the essence of the effigy is conveyed with minimal detail. This cup appears to relate to two other cups of similar design. One pictured in The Iroquois by Frank Gouldsmith Speck, p. 83, is also carved from maple burl and has an open worked handle. The effigy on that cup is hard to identify but is decisively zoomorphic in nature. 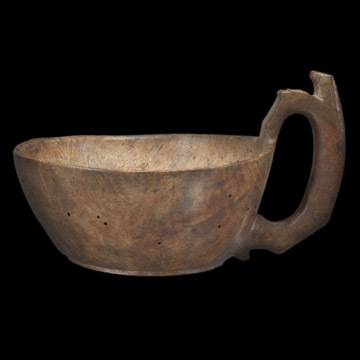 The other cup is in the Heye Collection of the National Museum of the American Indian and the outlines of the cup and the handle are similar to this one. The Heye example, however, lacks an effigy. Documentation from it notes the cup’s origin as Scaticook of the Mahican tribes of the Hudson River Valley of New York and Connecticut.